One of the tasks I was assigned was to fix the code preventing XenServer with Neutron from working properly. This configuration used to work well, but the support was broken when more and more changes were made in Neutron, and the lack of a CI environment with XenServer hid the problem. I began getting XenServer with Neutron back to a working state by following the outline in the Quantum with Grizzly blog post from a few years ago. It's important to note that with the Havana release, Quantum was renamed to Neutron, and we'll use Neutron throughout this post. During my work, I needed to debug why OpenStack images were not obtaining IP addresses. This blog post covers the workflow I used, and I hope you'll find it helpful. I had made some changes in the DevStack script to let XenServer with Neutron to be installed and run properly. The following are some debugging processes I followed when newly launched VMs could not get an IP from Neutron DHCP agent automatically. When guest VMs are booting, they will try to send DHCP request broadcast message within the same network broadcast domain and then wait for a DHCP server's reply. In OpenStack Neutron, the DHCP server, or DHCP agent, is responsible for allocating IP addresses. If VMs cannot get IP addresses, our first priority is to check whether the packets from the VMs can be received by the DHCP server. The results will look something like the following, and the "tapYYYY" entry is the one we care about. Meanwhile, you will definitely want to dump traffic in the OpenStack compute note, and with XenServer this is Dom0. When new instance is launched, there will be a new virtual interface created named “vifX.Y”. 'X' is the domain ID for the new VM and Y is the ID if the VIF defined in XAPI. Domain IDs are sequential - if the latest interface is vif20.0, the next one will most likely be vif21.0. Then you can try tcpdump -i vif21.0. Note that it may fail at first if the virtual interface hasn't been created yet, but once the virtual interface is created, you can monitor the packets. Theoretically you should see DHCP request and reply packets in Dom0; just like you see in DHCP agent side. Note: If you cannot catch the dump packet at the instance’s launching time, you can also try this using ifup eth0 after doing a login to the instance via XenCenter. "ifup eth0" will also trigger the instance to send a DHCP request. In most case, you should see the DHCP request packets sent out from Dom0, this means that the VM itself is OK. It has sent out DHCP request message. Note: Some images will try to send DHCP requests from time to time until it gets a response message. However, some images won’t. They will only try several times, e.g. three times, and if it cannot get DHCP response it won’t try again any more. In some scenarios, this will let the instance lose the chance of sending DHCP request. That’s why some people on the Internet suggest changing images when launching instance cannot get an IP address via DHCP. When I was first testing, I didn't see any DHCP request from the DHCP agent side. Where the request packet go? It’s possible that the packets are dropped? Then who dropped these packets? Why drop them? If we think it a bit more, it’s either L2 or L3 that dropped. With this in mind, we can begin to check one by one. For L3/L4, I don’t have a firewall setup and the security group’s default rule is to let all packets go through. So, I don’t spent so much effort on this part. For L2, since we use OVS, I began by checking OVS rules. If you are not familiar with OVS, this can take some time. At least I spent a lot of time on it to completely understand the mechanism and the rules. The main aim is to check all existing rules in Dom0 and DomU, and then try to find out which rule let the packets dropped. These rules in DomU look normal without concerns, so let's go on with Dom0 and try to find more. Looking at the traffic flow in picture 1, the traffic direction from VM to DHCP server is xapiX->xapiY(Dom0), then ->br-eth1->br-int(DomU). So, maybe some rules filtered the packets at the layer 2 level by OVS. While I do suspect xapiY, I cannot provide any specific reasons why. The lower priority=2 will be matched second, and it will drop the flow. So, will the flows be dropped? If the flow doesn’t have dl_vlan=1, it will be definitely be dropped. (2) I didn’t realize the problem was a missing tag for the new launched instance for a long time due to my lack of OVS understanding. Thus I didn’t have know to check the port’s tag first. So next time when we meet this problem, we can check these part first. For port vif16.0, it really doesn’t have tag with value 1, so the flow will be unconditionally dropped. Note: When launching a new instance under XenServer, it will have a virtual network interface named vifx.0, and from OVS’s point of view, it will also create a port and bind that interface correspondingly. The next step is to find out why the newly launched instance don’t have a tag in OVS. There is no obvious findings for new comers like me. Just read the code over and over and make assumptions and test and so forth. But after trying various ideas, I did find that each time when I restart neutron-openvswitch-agent(q-agt) in the Compute Node, the VM can get IP if I execute ifup eth0 command. So, there must be something which is done when q-agt restarts and is not done when launching a new instance. With this information, I can focus my code inspection. Finally I found that, with XenServer, when a new instance is launched, q-agt cannot detect the newly added port and it will not add a tag to the corresponding port. Finally, I found that with XenServer, our current implementation cannot read the OVS monitor's output, and thus q-agt doesn't know there is a new port added. But lucky enough, L2 Agent provides another way of getting the port changes, and thus we can use that way instead. Setting minimize_polling=false in the L2 agent's configuration file ensures the Agent does not rely on ovsdb-client monitor, which means that the port will be identified and the tag gets added properly! In this case, this is all that was needed to get an IP address and everything else worked normally. I hope the process I went through in debugging this problem will be beneficial to others. XenServer is a great choice of hypervisor for OpenStack based clouds, but there is no native integration between it and RedHat's RDO packages. This means that setting up an integrated environment using XenServer and RDO is more difficult than it should be. This blog post aims to resolve that, giving a method where CentOS can be set up easily to use XenServer as the hypervisor. The XenServer integration with OpenStack has some optimizations which means that only EXT3 storage is supported. Make sure when installing your XenServer you select Optimized for XenDesktop when prompted. Use XenCenter to check that the SR type is EXT3 as fixing it after creating the VMs will require deleting the VMs and starting again. With XenServer, the Nova Compute service must run in a virtual machine on the hypervisor that they will be controlling. As we're using CentOS 7.0 for this environment, create a VM using the CentOS 7.0 template in XenCenter. If you want to copy and paste the scripts from the rest of the blog, use the name "CentOS_RDO" for this VM. Install the CentOS 7.0 VM but shut it down before installing RDO. In single box environment, we need three networks, "Integration network", "External network", "VM network". If you have appropriate networks for the above (e.g. a network that gives you external access) then rename the existing network to have the appropriate name-label. Note that a helper script rdo_xenserver_helper.sh is provided for some of the later steps in this blog rely on these specific name labels, so if you choose not to use them then please also update the helper script. This step requires the VM to be shut down, as it's modifying the network setup and the PV tools have not been installed in the guest. You can also choose use helper script to do these in dom0. Use HIMN tool (plugin for XenCenter) to add internal management network to OpenStack VMs. This effectively performs the following operations, which could also be performed manually in dom0 or use rdo_xenserver_helper.sh. Note: If using the commands manually, they should be run when the OpenStack VM is shut down. Set up DHCP on the HIMN network for OpenStack VM, allowing OpenStack VM to access its own hypervisor on the static address 169.254.0.1. Run helper script in domU. Using the RDO Quickstart detailed installation guide, please follow the instructions step by step. This manual only points out the steps that you must pay attention to during installation. Rather than running packstack immediately, we need to generate an answerfile so that we can tweak the configuration. : physnet1 is physical network name for VLAN provider and tenant networks. 1000:1050 is VLAN tag ranges on each physical network for allocation to tenant networks. : br-eth1 is OVS bridge for VM network. br-ex is OVS bridge for External network, neutron L3 agent use it for external traffic. : eth1 is OpenStack VM's NIC which connected to VM network. eth2 is OpenStack VM's NIC which connected to External network. Copy Nova and Neutron plugins to XenServer host. Edit /etc/nova/nova.conf, switch compute driver to XenServer. 169.254.0.1 is hypervisor dom0's address which OpenStack VM can reach via HIMN. Install XenAPI Python XML RPC lightweight bindings. Edit /etc/neutron/rootwrap.conf to support uing XenServer remotely. # target a XenServer/XCP compute host's dom0. XenServer has a seperation of dom0 and domU and all instances' VIFs are actually managed by dom0. Their corresponding OVS ports are created in dom0. Thus, we should manually start the other ovs agent which is in charge of these ports and is talking to dom0, refer xenserver_neutron picture. xapi3 the integration bridge is xapX in the graph. 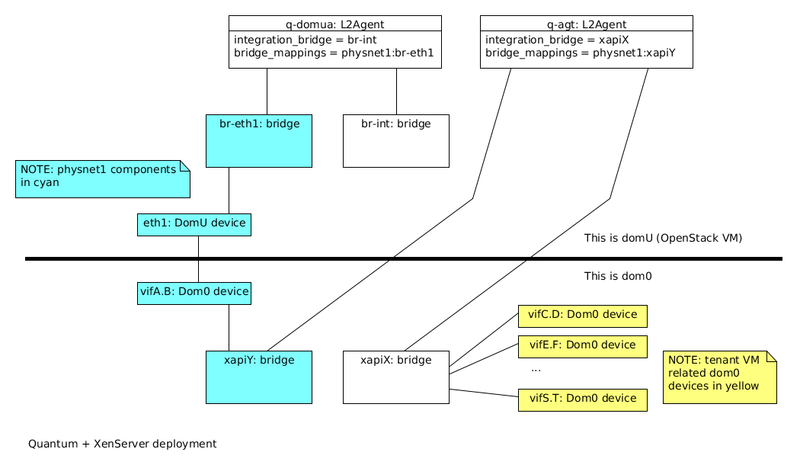 xapi2 is vm network bridge, it's xapiY in the graph. PING 172.24.4.228 (172.24.4.228) 56(84) bytes of data. Some of you might have noticed that Citrix joined the OpenStack Foundation yesterday and may be wondering what this means for two key technologies I've been closely involved with; Apache CloudStack and XenServer. The first, and arguably most important thing to note is that as Steve Wilson has stated, we're embracing both OpenStack and CloudStack to help further innovation. Nand Mulchandani also highlights that a culture of “anyness” is a core part of Citrix. With all the noise in the market about the various IaaS cloud solutions, supporting user choice is an important point to be clear on. So with that as backdrop, what does this really mean? As I mentioned in my blog about OpenStack Summit, I really want XenServer to be a first class citizen within OpenStack. I tried to further that objective through submission of presentations to OpenStack Summit, but if you look at the schedule you'll note that no XenServer related talks were accepted. That's unfortunate, and really speaks to the challenge we face within a community when we're not the obvious or default choice. Obviously we can raise our profile through contributions and simply showing up at OpenStack events, but there is also a pretty important and easy thing we can change. When a vendor evaluates a technology, they look at the ecosystem around it. OpenStack technology has a ton of buzz. If you look on job boards, you'll see many postings for OpenStack positions. If you search for cloud technologies, key supporters of OpenStack will be listed. Importantly, when selecting a technology suite, you'll look at who supports their technology with the suite and use them in your short list. Until today, it was unclear if Citrix actively supported the use of XenServer within OpenStack. Our joining the OpenStack Foundation is one way of signaling to those who prefer OpenStack that Citrix is supportive of their efforts. So if you've been quietly using XenServer in an OpenStack environment, I want to learn more about it. I want to learn what works, and where the pain points are so they might be addressed. If you've ever questioned if production support for XenServer when used with OpenStack could be supported, the answer is yes, and here's a link to buy support (hard sell over)! For those of you who have adopted XenServer for your CloudStack clouds, nothing has changed and you should feel nothing change. XenServer will remain a first class citizen in CloudStack, and we'll continue to improve all aspects of XenServer operation within CloudStack such that XenServer remains an obvious choice. You'll continue to see XenServer content proposed to CloudStack events, and I hope you'll continue to accept those talks. I promise to continue to work on cool things like the Packer work I presented at CloudStack Day Austin which showed a method to migrate legacy infrastructure running on XenServer to a CloudStack cloud powered by XenServer; all without the users even noticing the migration happened. My hope is that the OpenStack community will want some of those same cool things, but that will take time and can't be forced. So in the end this really isn't a commentary about which cloud solution is better, but a case of allowing customer choice. OpenStack has mindshare, and it only makes sense for Citrix and its technology suite to have a seat at the table. With Citrix openly supporting its technologies when deployed with OpenStack, everyone has the freedom to choose which solution works best.